April 5th, 2018. The Japanese card of the day is the Little Sage, Marron. A Double Rare from V-BT01: UNITE! TEAM Q4!, this Marron acts as an easily-repeatable 11000-power booster that can develop card advantage by working off of the skills of other cards. 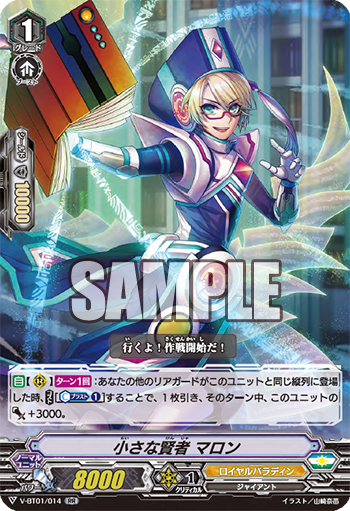 AUTO [Rearguard Circle] Once per turn: When your other rearguard is placed in the same column as this unit, by paying [Counterblast 1], draw 1 card, and during that turn this unit gets Power +3000. Marron's once-per-turn skill is a net +1 when calling units normally from hand, but it also enables combos with any units that superior call from the deck, or that draw after calling through their skill. Knight Squire Allen and Alfred Early both do the latter, calling a card from hand and then drawing; thus on one turn we can use Allen's skill to call Marron from hand to draw, then when we ride Alfred Early next turn we use his own skill to bring out Blaster Blade on the same column as Marron, and draw 2. The downside to these types of plays is that Marron's skill only turns himself into an 11k booster for the turn for a 21k total, whereas Wingal can boost Blaster Blade all the way up to 23k, and the new magic numbers revolve around 13k bodies. In offense Marron with Blaster Blade is functionally identical to the basic 18k column. One issue that will be apparent to long-time Royal Paladin cardfighters is just how counterblast intensive this new deck is shaping up to be. The extended play described above involves counterblasting 4 across two turns, and that's without knowing what Blaster Blade's costs will be. (If that cost follows Nehalem, it could be as high as CB2.) Without a reliable way to countercharge, managing damage will quickly become difficult in the new Royal Paladins. However, to run the optimal grade ratios of 13-11-9 or the majority-preferred 13-12-8, we would need to find a way to cut space while still getting consistent access to Marron, Allen, and Wingal. 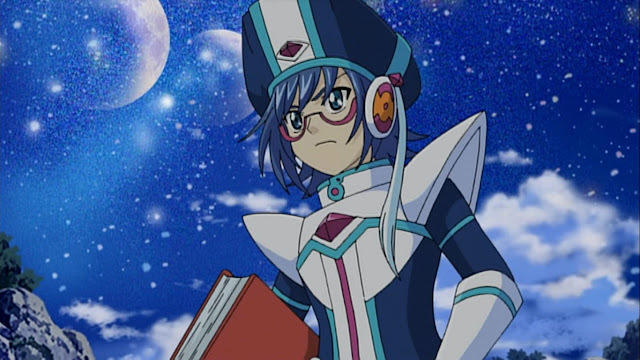 In terms of overall priority, Marron has precedent over Allen for being able to reuse his skill turn after turn and becomes better the sooner you draw him due to his skill not being on-place, whereas with Allen you may have to refrain from putting him down in order to be able to use his effect later. Wingal has the lowest priority despite giving the better boost, because card advantage trumps raw numbers, and he's specific to one grade 2 that on average we draw 2 copies of per game. With both builds Marron and Allen edging Wingal out is unfortunate, but it's debatable if we even should be running 2 of him over Allen when Allen is compatible with a broader range of units. You could just as easily run 4 Allen and 1 Wingal. Time will tell as more units are unveiled. The Little Sage Marron is illustrated by Yamazaki Nanae, who also illustrated the original Little Sage Marron in 2011. The previous Japanese card of the day was the Prowling Dragon, Striken. V-Booster Set 01: UNITE! TEAM Q4! will launch in Japan May 25th, 2018, and in English June 22nd, 2018. It will be preceded by V-Trial Deck 01: Sendou Aichi, and V-TD02: Kai Toshiki, launching in Japanese May 11th, 2018, and in English June 8th, 2018. Both Trial Decks will be accompanied by a new sleeve based on the "Imaginary Gift" design. The accompanying new anime series, codenamed "Origin," will begin airing May 5th, 2018, on TV Tokyo and affiliated stations. It will be simulcast with English subtitles on YouTube and Crunchyroll.